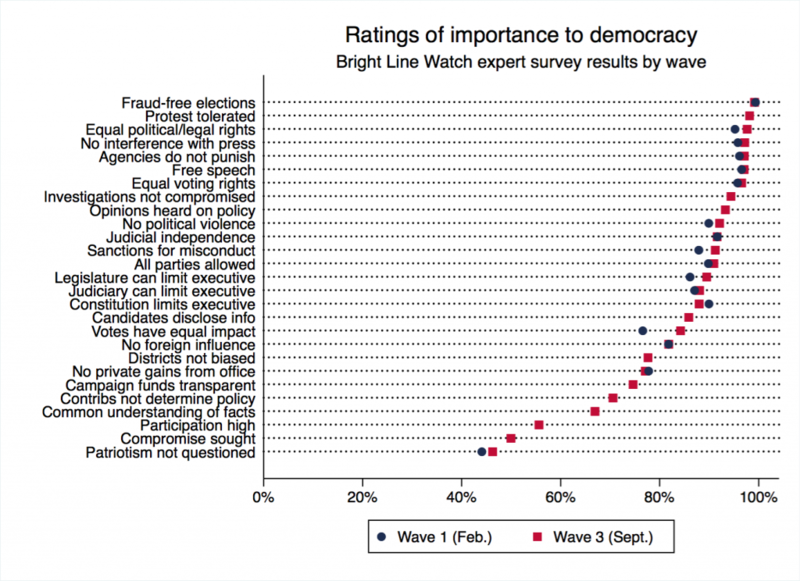 Given wide­spread concern about the possible erosion of democracy in the United States, Bright Line Watch has conducted expert surveys since early 2017 asking thousands of pro­fes­sion­al political sci­en­tists to identify the dimen­sions of democracy they see as most important and to rate how well the U.S. is per­form­ing on them. But does the public agree with those assessments? This Bright Line Watch report sum­ma­rizes our third survey on the state of democracy in the United States. Uniquely, this round directly compares results from parallel surveys of our expert sample of pro­fes­sion­al political sci­en­tists and a rep­re­sen­ta­tive sample of the American public recruited from the YouGov online survey panel. In our expert surveys, including the most recent one, political sci­en­tists have drawn sharp dis­tinc­tions between dimen­sions that are crucial to democracy such as clean and inclusive elections and others that they see as less crucial such as a common under­stand­ing of facts. The good news is that on these most important dimen­sions, the experts see American democracy as per­form­ing well. Elections are basically fraud free, in their view, and rights of asso­ci­a­tion are respected. 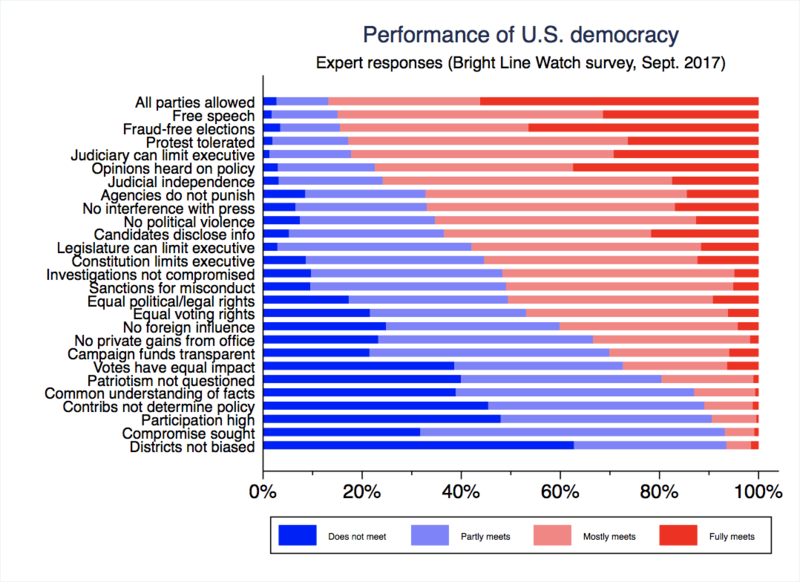 On some other dimen­sions, the per­for­mance of U.S. democracy is weaker, but these are often aspects of democracy that experts view as less important. Politicians fre­quent­ly impugn their opponents’ patri­o­tism, for instance, but American democracy is not directly threat­ened by this lack of rhetor­i­cal restraint. To probe the public’s views of the health of U.S. democracy, we asked a rep­re­sen­ta­tive sample of 3,000 American adults the same questions that we asked our expert sample (details on our surveys are provided below; both were conducted September 9–18, 2017). 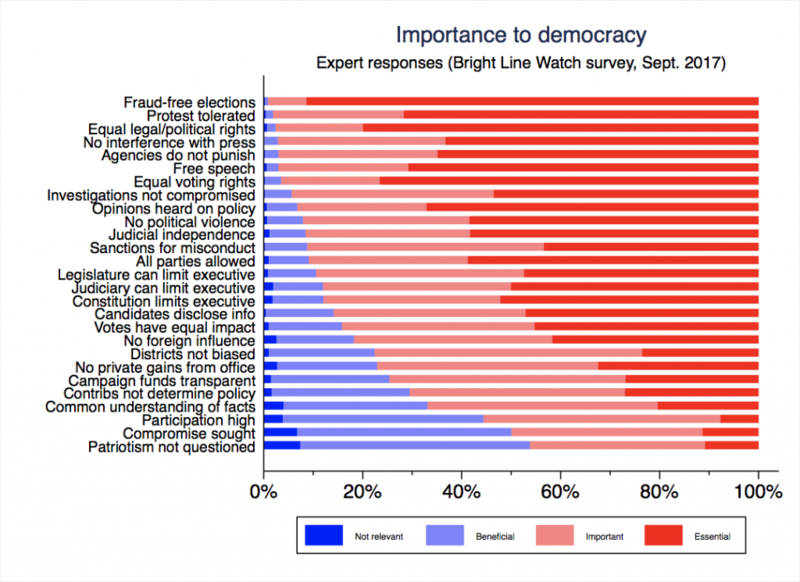 What are the most important dimen­sions of democracy and how is the U.S. per­form­ing on them? The sen­si­tiv­i­ty of common citizens to threats to democracy is important. The concept of a “bright line” for democracy (from which our orga­ni­za­tion takes it name) suggests that some vio­la­tions of insti­tu­tions and norms will be so self-evident and egregious that common people will reject them. If we found out the public was com­pla­cent about threats to demo­c­ra­t­ic insti­tu­tions and norms, it would be a cause for concern. However, we find the opposite. The public is quite concerned about the state of U.S. democracy, espe­cial­ly those who dis­ap­prove of President Trump. Americans’ ratings of demo­c­ra­t­ic per­for­mance are often worse than those of experts, espe­cial­ly in the areas experts identify as the most important. 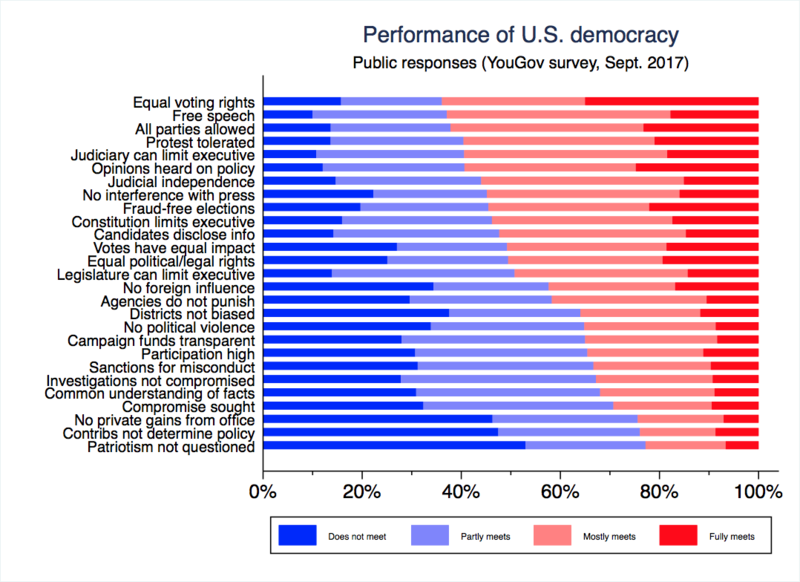 In general, experts seem to have a less negative view of how well U.S. democracy is doing than the public. We summarize the key findings from our data below. The public’s greater skep­ti­cism did not extend to all dimen­sions of demo­c­ra­t­ic per­for­mance. They were less dis­cour­aged than experts about matters of electoral fairness and worry less about electoral districts being biased, votes having an unequal impact on outcomes, large donors deter­min­ing electoral outcomes, and par­tic­i­pa­tion rates being low. On all these counts, we suspect that the broader famil­iar­i­ty among experts with inter­na­tion­al standards might account for their relative pessimism. Most other democ­ra­cies have in place electoral rules that produce clearly better results on these items. The other set of state­ments on which the experts rate U.S. per­for­mance lower than the public relates to discourse and behav­ioral norms: seeking com­pro­mise, main­tain­ing a common under­stand­ing of facts, and not ques­tion­ing the loyalties and integrity of political opponents. Given the sharp diver­gence seen between sup­port­ers and opponents of President Trump in many domains, we were inter­est­ed to see whether this polar­iza­tion extended to their opinions about the impor­tance of various aspects of democracy. Figure 3 below separates respon­dents by whether they approve (strongly or somewhat) and those who dis­ap­prove (strongly or somewhat) of President Trump’s job per­for­mance. For respon­dents in each group, the respec­tive markers indicate the per­cent­age who rate each statement of principle to be either essential or important to democracy. The state­ments are listed in descend­ing order of overall impor­tance (that is, the total per­cent­age of Americans who rate it as essential or important in the pop­u­la­tion as a whole). Trump’s backers and detrac­tors often have quite similar views on which dimen­sions of democracy matter most. Both groups rated clean elections, polit­i­cal­ly neutral inves­ti­ga­tions of public officials, and equal legal, political, and voting rights as most important for democracy. Both groups also rated norms of discourse, such as seeking com­pro­mise with one’s political opponents and not calling their patri­o­tism into question, as least important. The rough par­al­lelism in impor­tance ratings across the range of state­ments suggests that what Trump sup­port­ers and opponents value in democracy is not entirely antithetical. There are some intrigu­ing dif­fer­ences, however. 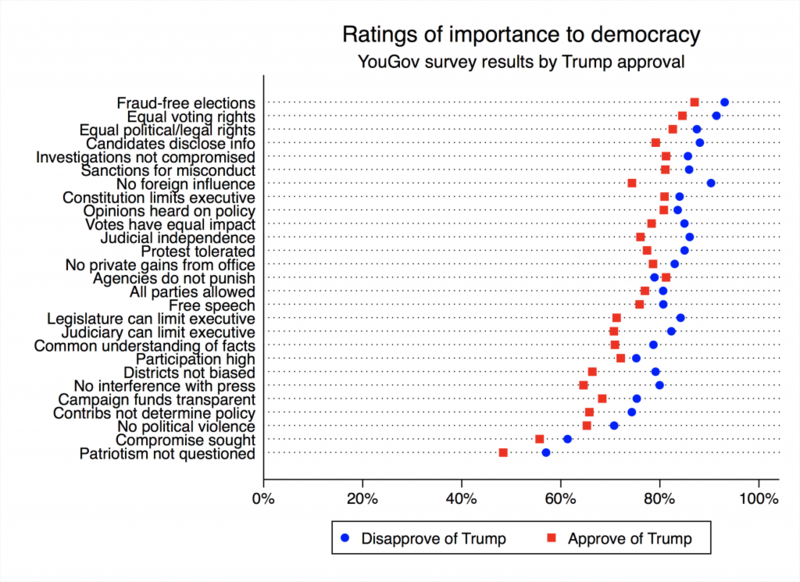 With only one exception (“Government agencies are not used to monitor, attack, or punish political opponents”), those who dis­ap­prove of Trump rate each principle as more important to democracy than those who approve. Relatively speaking, Trump sup­port­ers are pre­oc­cu­pied with the political neu­tral­i­ty of gov­ern­ment agencies even while their champion heads the executive branch. This finding may indicate their embrace of the “deep state” narrative, according to which executive branch agencies are respon­sive to polit­i­cal­ly motivated direc­tives from sources other than (and hostile to) the White House. All of these are rated as more important by Trump opponents than his sup­port­ers. The reasons seem straight­for­ward — many of the president’s sup­port­ers likely share his con­fronta­tion­al posture toward the news media, while Trump skeptics are more concerned with checking executive authority and foreign influence. 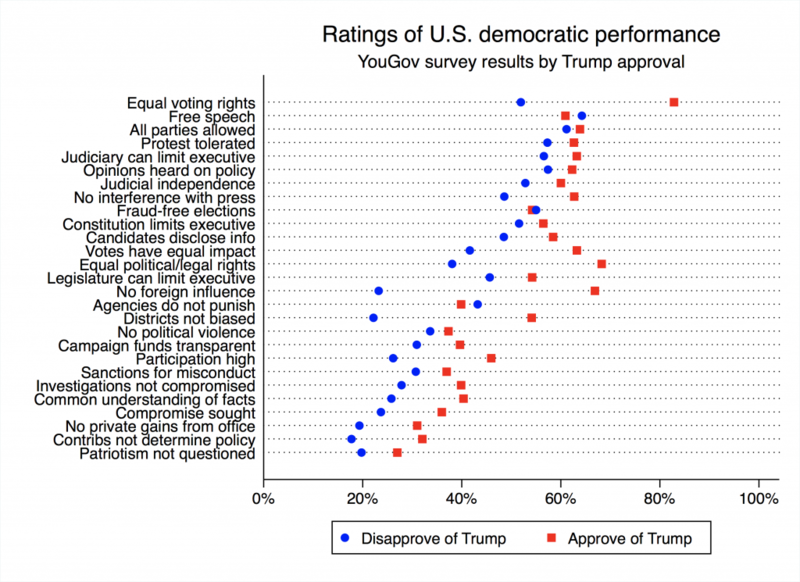 Unsurprisingly, we observe much greater polar­iza­tion in views of the per­for­mance of U.S. democracy between Trump sup­port­ers and opponents. Specifically, respon­dents who approve of Trump rate current per­for­mance more favorably than do those who dis­ap­prove on most of our 27 prin­ci­ples (see Figure 4). We cannot imagine anyone who would greet this news with surprise, but we direct attention to the handful of excep­tions and to the wide variation in assess­ment gaps across items. On four items, Trump opponents rated U.S. per­for­mance as slightly better than his sup­port­ers did: fraud-free elections, the political neu­tral­i­ty of gov­ern­ment agencies, pro­tec­tion of free speech, and the pre­ven­tion of private political violence. Trump’s sup­port­ers’ relative skep­ti­cism on the first three items likely reflects the president’s own narrative of vic­tim­hood with respect to voter fraud, polit­i­cal­ly motivated inves­ti­ga­tions, and even political cor­rect­ness. The finding on private political violence is more puzzling, however, espe­cial­ly given that our surveys were only conducted about a month after a protester was killed in Charlottesville, VA.
We observe the greatest polar­iza­tion among our respon­dents on whether the legal and electoral playing field is level. Trump approvers rate our democracy as dra­mat­i­cal­ly better than those who dis­ap­prove at guar­an­tee­ing equal legal, political, and voting rights and at con­duct­ing elections in which all votes have equal impact, district bound­aries are not biased by political par­ti­san­ship, and foreign influence is limited. This list covers political reform issues on which Democrats perceive the greatest unfair­ness in American elections: ballot access, partisan ger­ry­man­der­ing, the Electoral College, and alle­ga­tions of Russian influence. The broader category of equal legal rights also includes divisive issues of policing and treatment in criminal justice. In short, across prin­ci­ples that address the indi­vid­ual rights of citizens and basic fairness, those who approve of Trump and those who dis­ap­prove differ dra­mat­i­cal­ly on how U.S. democracy is performing. We see less polar­iza­tion, in contrast, on items related to insti­tu­tions rather than indi­vid­u­als. These include non-inter­fer­ence with the press, tol­er­at­ing political parties regard­less of their ide­olo­gies, providing elections that are free of outright fraud, and the effec­tive­ness of the Constitution in limiting executive authority. The basic message, then, is that Trump approvers and dis­ap­provers are much farther apart in their assess­ments of demo­c­ra­t­ic per­for­mance than on their under­ly­ing demo­c­ra­t­ic priorities. 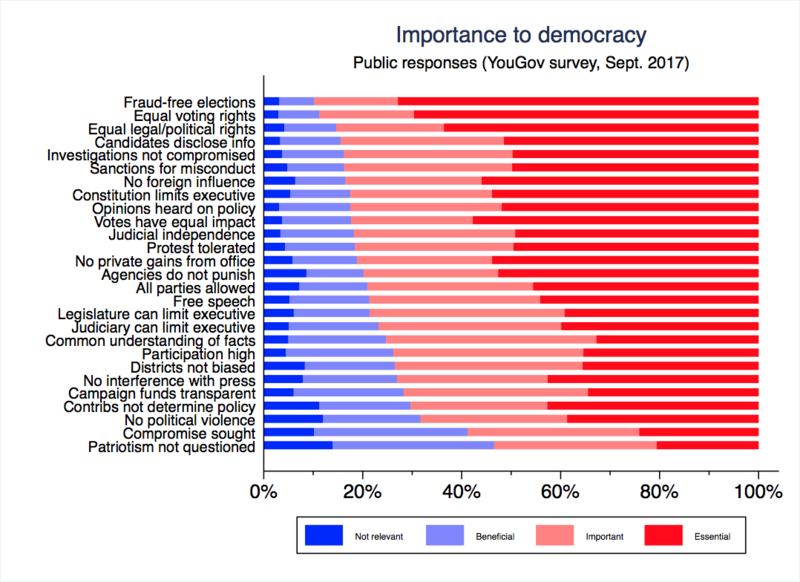 The experts we surveyed tended to regard the items on our list as more critical to democracy than members of the public regard­less of their political views. This trend is visible in Figure 5 (below), which ranks state­ments in descend­ing order of their impor­tance as rated by our expert respon­dents. The items with the biggest gaps between experts and the public include a number of those for which Trump sup­port­ers and opponents were rel­a­tive­ly polarized, including press freedom and the effec­tive­ness of leg­isla­tive and judicial checks on the executive. Not only did experts view discrete items as more crucial to demo­c­ra­t­ic gov­er­nance, they also valued living in democracy more highly. 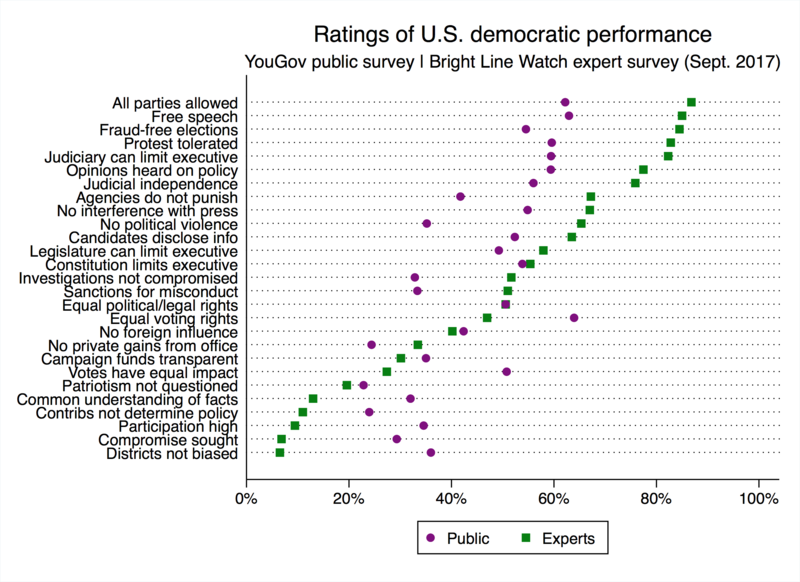 Figure 6 sum­ma­rizes the dif­fer­ence between experts and the public in their ratings of the impor­tance of living in a democracy. We speculate that experts’ greater awareness of author­i­tar­i­an and auto­crat­ic expe­ri­ences across the globe both today and in the past makes them warier of shifts away from demo­c­ra­t­ic rule. 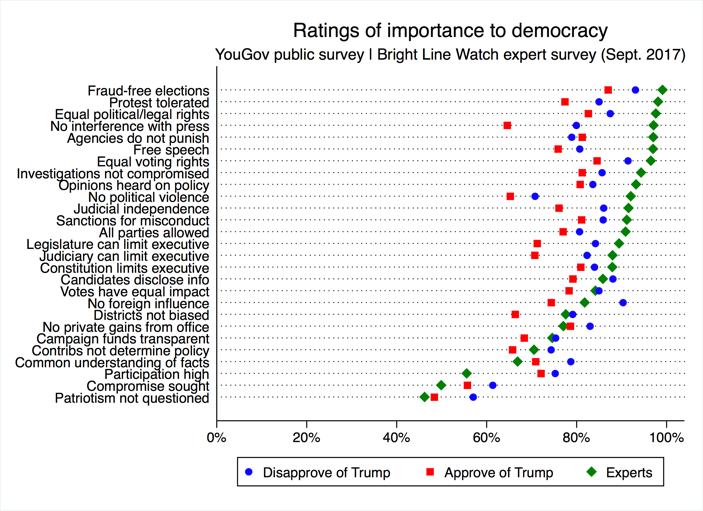 To this point, we have analyzed data from our September 2017 surveys of experts and the public, but Bright Line Watch also surveyed experts in February and May 2017. As Figure 7 indicates, their assess­ments of U.S. demo­c­ra­t­ic per­for­mance show a remark­able level of stability over time. How valid are the expert ratings we collect? A common criticism of Bright Line Watch has been that political sci­en­tists are not like the public so measuring their beliefs may tell us little of relevance to politics. A more pointed version of this general critique holds that academics are reflex­ive­ly hostile to President Trump and our experts are using the survey to disparage the president. However, the results from our companion expert and public surveys are incon­sis­tent with this argument. Figure 8 compares expert versus public assess­ments of demo­c­ra­t­ic per­for­mance on our 27 state­ments, with public responses again separated by respon­dent approval of President Trump’s job performance. The most striking pattern in the figure is that the experts rate demo­c­ra­t­ic per­for­mance higher than both Trump approvers and dis­ap­provers on 15 of the 27 state­ments. The experts are also lower than both groups on nine state­ments. The former list includes a cluster of rights- and pro­tec­tions-related prin­ci­ples as well as judicial inde­pen­dence and the absence of outright electoral fraud. Where they are dis­cour­aged, by contrast, the experts’ dismay is also pro­nounced. They rank per­for­mance on electoral fairness and on civil discourse lower than even Trump opponents in the public. On both impor­tance and per­for­mance, the expert judgments vary more widely across state­ments than do those of the public. If (as we hope) our experts are unusually well informed about political issues, this finding suggests that more infor­ma­tion leads them to draw sharper dis­tinc­tions than respon­dents in the public sample. The surveys also show that expert judgments do not line up pre­dictably along a Trump versus anti-Trump axis. If our expert respon­dents were reflex­ive­ly anti-Trump and were using the surveys to hype alarmism, then we should observe experts to rate the current quality of U.S. democracy lower than the public does. The opposite is true, however, for their overall ratings and for most state­ments of demo­c­ra­t­ic principles. Bright Line Watch’s most recent surveys produced some expected results but also many we did not antic­i­pate. We show that Trump sup­port­ers rate the current per­for­mance of U.S. democracy higher than the president’s opponents, which comes as no surprise. However, the specific areas on which Trump sup­port­ers and opponents most widely differ are instruc­tive. We observe the greatest polar­iza­tion on issues of basic fairness in electoral com­pe­ti­tion and on indi­vid­ual rights. On these matters, Trump approvers regard American democracy as func­tion­ing well, with solid majori­ties holding that demo­c­ra­t­ic standards are fully or mostly met, while those who dis­ap­prove of Trump hold much more negative views. By contrast, dif­fer­ences between Trump sup­port­ers and opponents are less pro­nounced on the per­for­mance of insti­tu­tions essential to democracy such as the press, political parties, and con­sti­tu­tion­al and judicial checks on authority. The bigger surprises came in com­par­isons between political science experts and the public. Elite public opinion, and academia in par­tic­u­lar, is sometimes dismissed as apoc­a­lyp­tic with respect to Trump and quick to declare his pres­i­den­cy an exis­ten­tial threat to American democracy. Our experts are certainly uneasy about the per­for­mance of U.S. democracy on a host of dimen­sions. They are par­tic­u­lar­ly dis­cour­aged about norms of civility and the state of political discourse and they share much of the public’s distress about the fairness of many U.S. electoral practices. 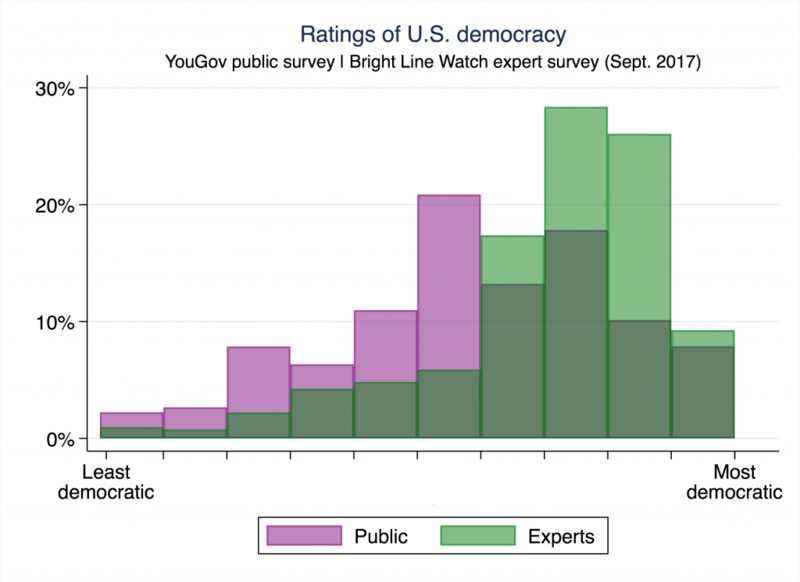 Yet expert opinion is less concerned than the public about the state of American democracy as a whole and on many of the par­tic­u­lars. The experts’ relative optimism might stem from their broader, more com­par­a­tive per­spec­tive or from exposure to wider ranges of news sources, but either way they are less despair­ing than the public overall. The experts also do not perceive sys­tem­at­ic demo­c­ra­t­ic degra­da­tion in the seven months since our first survey. In short, the experts on which Bright Line Watch has depended appear to be neither alarmist nor par­tic­u­lar­ly partisan in their judgments. On the whole, we regard their assess­ments as judicious and reas­sur­ing for our ability to learn from expert opinion going forward. 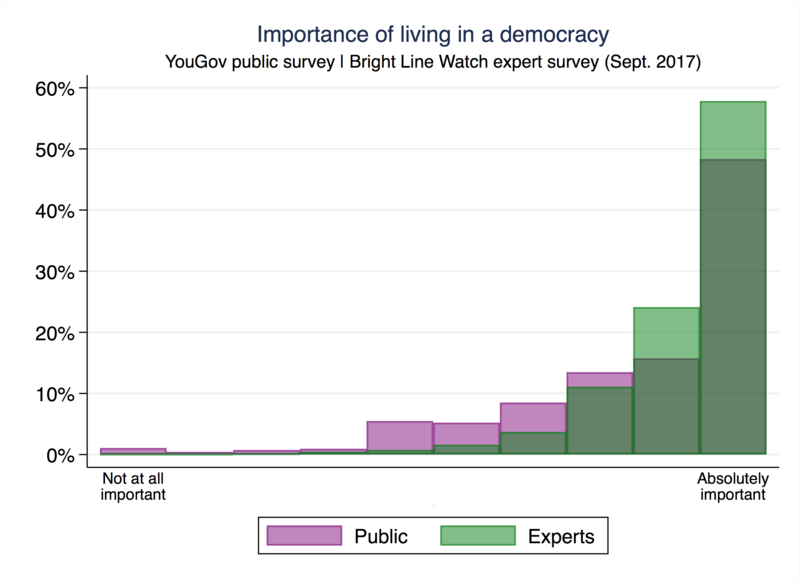 From September 9–18, 2017, Bright Line Watch conducted its third survey on the state of democracy in the United States. Waves 1 (February 2017) and 2 (May 2017) targeted expert respon­dents only. In each case, we contacted nearly 10,000 political sci­en­tists who are faculty at U.S. uni­ver­si­ties, pre­sent­ing respon­dents with a series of questions about demo­c­ra­t­ic pri­or­i­ties and about the per­for­mance of democracy in the United States. Expert: On September 10, we sent email invi­ta­tions to 9,450 political science faculty, inviting par­tic­i­pa­tion. By September 18, after two reminder emails, we had complete responses from 1,055 (a response rate of 11%). Public: YouGov fielded the public survey from September 9–18, producing 3,000 complete responses. Participants in each survey responded to identical batteries of questions about demo­c­ra­t­ic pri­or­i­ties and per­for­mance. The data from both the expert and public surveys are available here. All analyses of the public data from YouGov incor­po­rate survey weights. 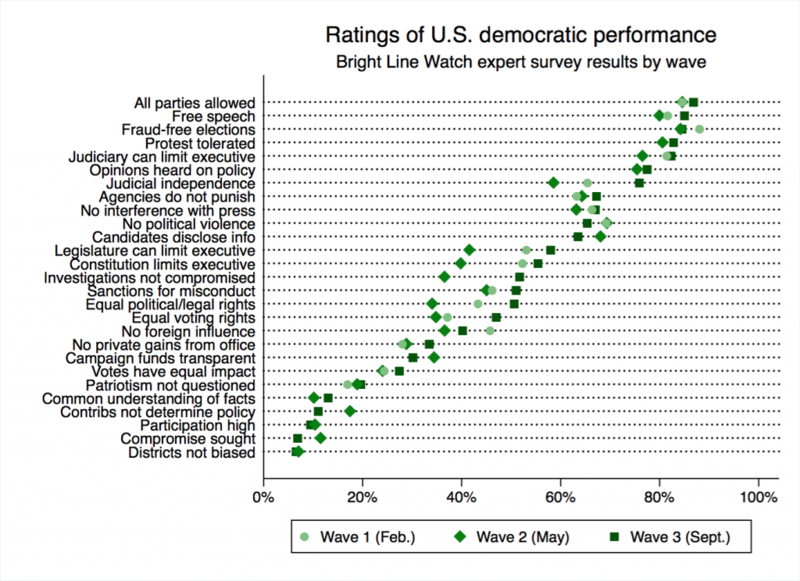 Bright Line Watch’s Wave 1 survey included 19 state­ments of demo­c­ra­t­ic prin­ci­ples. Based on feedback from respon­dents and con­sul­ta­tion with col­leagues, we expanded that list to 29 state­ments in Wave 2. We then reduced that set to what we intend to be a stable set of 27 state­ments for the Wave 3 surveys. 17 of those 27 state­ments were included in Wave 1, and all 27 were included in Wave 2. The full set of state­ments is below. In the interest of clarity, this list groups the prin­ci­ples the­mat­i­cal­ly. In the surveys, the prin­ci­ples were not cat­e­go­rized or labeled. Each respon­dent was shown a randomly selected subset of state­ments (12 for experts, 9 for the general public) and asked to first rate the impor­tance of those state­ments and then rate the per­for­mance of the United States on those dimensions. This enhances democracy, but is not required for democracy. If this is absent, democracy is compromised. A country cannot be con­sid­ered demo­c­ra­t­ic without this. The figures that follow offer a more granular view of responses to our surveys. In Figures A1 to A4, the state­ments are presented in descend­ing order of positive responses. For impor­tance ratings, we tallied the pro­por­tion of responses that assessed a given principle as “essential” or “important” to democracy (rather than merely “ben­e­fi­cial … but not required” or “not relevant”). On per­for­mance, we tallied the pro­por­tion that assessed the United States as “fully” or “mostly” meeting the standard (rather than “partly” or “does not meet”). Our last main point is a method­olog­i­cal one but nonethe­less crit­i­cal­ly important. The Wave 3 survey provided us an oppor­tu­ni­ty to test the reli­a­bil­i­ty of our survey instru­ment by comparing expert responses on the impor­tance of demo­c­ra­t­ic prin­ci­ples to Wave 1. We expect these per­cep­tions to be stable among our respon­dents (unlike ratings of demo­c­ra­t­ic per­for­mance, which may vary over time). For that reason, we did not include the impor­tance battery on the Wave 2 survey and do not intend to repeat it in every wave, as with per­for­mance. However, we did repeat the impor­tance battery on Wave 3 to allow us to compare expert and public ratings of demo­c­ra­t­ic per­for­mance at the same time. These ratings provide us with the oppor­tu­ni­ty to compare expert responses on impor­tance between February and September 2017. The results are shown in Figure A5. On the 17 state­ments included in both waves, the impor­tance ratings are strik­ing­ly con­sis­tent. These results suggests that the instru­ment is highly reliable. Responses of “not sure” are excluded when cal­cu­lat­ing those proportions.